What girl doesn't want bouncy beautiful locks? When you're doing your hair shampoo is definitely the base of everything else. 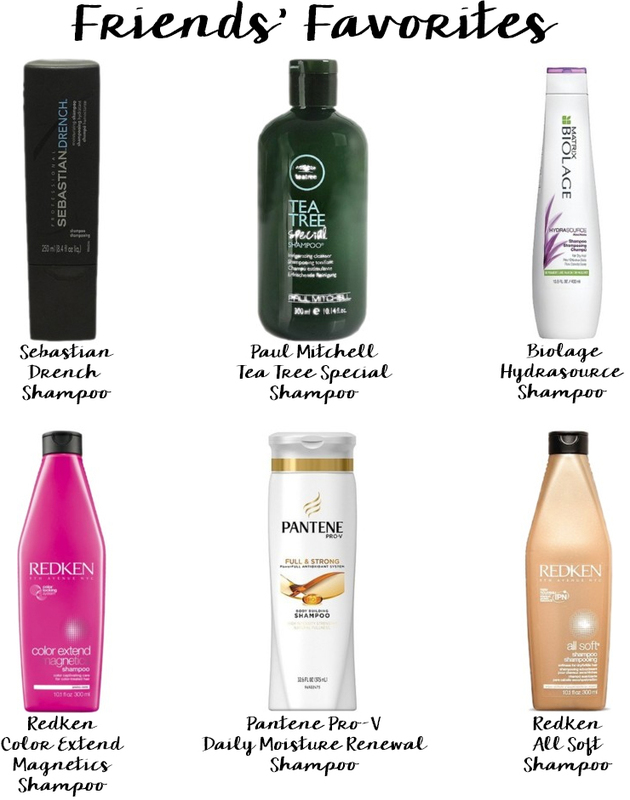 Shampoo is such an important part of every girl's beauty routine and everyone has their favorites. Since it is something almost everyone uses, I thought it was the perfect way to introduce hair into my 'The Best' Series. 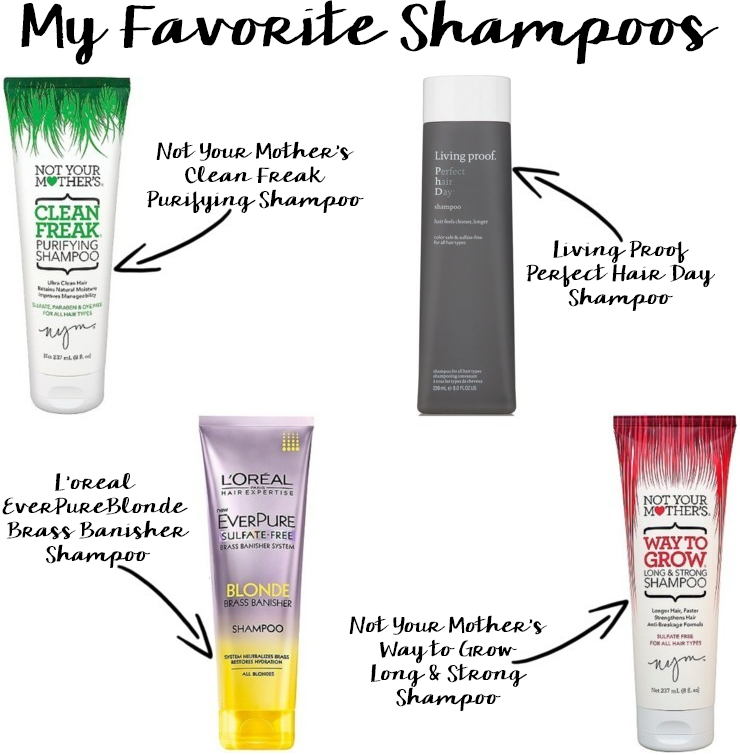 Below I have for you not only my favorite shampoos, but shampoo recommendations from my friends with the most gorgeous locks, too. This gentle clarifying shampoo really helps to breakdown any buildup to ensure your hair is as clean as possible. Every time I use this my hair feels so fresh and clean, always looks great. I also love the pretty minty scent that this leaves in my hair. This shampoo, made famous by the brand's Co-Owner Jennifer Aniston, is hands down the best shampoo I've ever used. The formulation works to help keep hair cleaner longer so that you can go longer between shampoos, which helps to keep your hair healthy. It also makes your hair super shiny and glossy, leaving you feeling a bit more like Jen. For all my blonde girls this shampoo is a must try. It's formulated for color treated blonde hair and while I've never dyed my hair before I like to use shampoos for blonde hair that prevent brassiness just to take extra care of my hair. This shampoo will baby your blonde and leave it looking gorgeous and fresh. I love this fruity scented shampoo for how it cleans my hair and makes it look. It's filled with vitamins, herbs, and bioactive extracts that help to stimulate growth. This is my current go-to shampoo. Jordyn says that this shampoo is a game changer for girls who color their hair, "It's great for dry/chemically damaged hair. My hair felt like straw and it makes it feel nourished and soft again!" Maggie's favorite part of this special shampoo is the extra bonus that comes with it, "It makes my scalp all tingly when I use it so I really feel my hair getting clean!" She also loves that "it smells really minty and fresh." I'm always complementing Kelly on how pretty her hair looks and she told me that this is shampoo is her secret, "It makes my hair really silky and strong, afterwards I just use a leave in conditioner and let it air dry." Kristi uses this to help keep her color treated hair looking its best. She's tried numerous other shampoos and says, "It's definitely one of the best smelling shampoos I've ever used!" Bridget has been a Pantene devotee for quite some time now and her hair always looks great! She says that she "loves the smell and how it makes my hair soft." Shannon uses this shampoo because it takes good care of her beautiful curls, "It really moisturizes my hair and leaves it soft and healthy." What is your favorite shampoo? Make sure to add me on Snapchat - @kthomp22! Today I'm linking up with WIWW, Mid Week Muse, and WIWW. Excited to try some of these, I haven't found a shampoo/conditioner that I love so maybe one of these will work for me! i love all of the ones you shared! biolage, for some crazy reason, makes my scalp itch. always has. it's embarassing how many shampoos i have in my closet at the moment. Thanks for this insightful post and specific description on various shampoo. It really worth the time reading till the end. It's really true that this shampoo, made famous by the brand's Co-Owner Jennifer Aniston, is hands down the best shampoo I've ever used. The formulation works to help keep hair cleaner longer so that you can go longer. I recommended it for getting silky hair. Hello, I have browsed most of your posts. This post is probably where I got the most useful information for my research. Thanks for posting, maybe we can see more on this. Are you aware of any other websites on this subject. The Blush Blonde 2016. Powered by Blogger.